This is where cricket publishers Wisden first opened their shop. 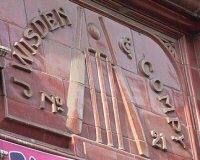 Description: Here, next to Leicester Square tube station entrance, a small shop unit was let to J. Wisden, the biggest cricket publishers and equipment suppliers. 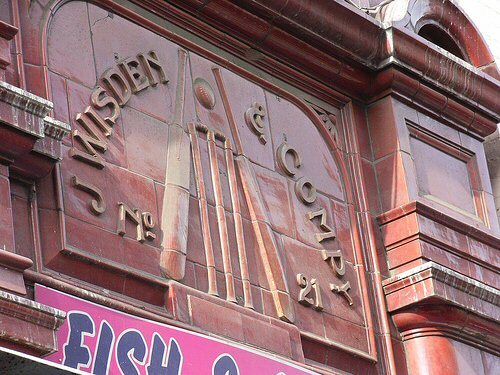 The building, known as Transad House, still has the old wisden frieze sign visible above the actual fish & chips shop. The red facade above the station entrance on the corner between Cranbourn Street and Charing Cross Road, familiar to many Underground stations facades, was designed by Leslie Green. 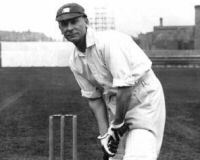 Legendary Surrey & England cricketer Jack Hobbs lived here.